First and foremost, we are guinea pig lovers! We only breed healthy, adult guineas that have excellent demeanor. We are not a mass breeder. 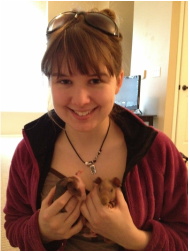 We have only two male and two female skinny pigs that we treat as our "children." This way, they are extremely sociable and loving, receive daily individual attention, and are kept in the best of health. Their babies (or litters) are handled from birth so that you will receive a highly socialized, healthy, and well cared for pet. All guinea pigs adopted will come with papers stating their genealogy. Where are you located? Aurora, IL. We are a short 30 miles west of Chicago. Do you ship piggies? We do not ship guinea pigs, as this can be very stressful for them and at times even bad for their health. However, in our experience they have done well traveling in cars. Also, many airlines allow you to carry them onto the plane with you. How much do piggies cost? We offer very competitive pricing, based upon demand, coloring and age of piggy. We do not breed to become wealthy; rather, we do it out of our love of it and to offer you a wonderful pet. To see specific pricing, see the "Adopt me!" page. Most hairless pigs are around $100. How often are new piggies available? Approximately every 2 to 4 months, one to six new piggies are born. Expected litter due dates are posted on the "Adopt me" page. Can I reserve a pig before it is born or ready to go home? Yes, with a deposit (that will go toward the cost of the piggy) a very limited number of people may reserve piggies before they are born or ready to go home. If you reserve one before it is born and the litter does not produce the number of piggies to reservations, the reservations will be honored in the order they were made. If you are not able to receive a piggy because of this, your may move your reservation to the next litter or may choose to receive your deposit back. However, we do everything in our power for this to not happen - that is why we only offer a very limited number of reservations. If it is a high concern to you, reserve your piggy as early as possible. How soon after birth can I bring my piggy home? Approximately 3-4 weeks after birth, the piggies will be ready to go home. We will send them home with you as soon as it is safe for the piggy to be separated from its mother. This depends not only on age but also size and health. What do I need to bring when picking up my piggy? Will they come with anything? We recommend that you bring a small cage or carrier with bedding at the bottom of it. Your cage at home should already be prepared (for information on this, please visit the "Skinny FAQ and Care" page of this site). If you do not bring a cage or carrier, we will send your piggy home in a small box lined with bedding; this is only meant for very short car trips, though, and should be replaced as soon as possible with an official carrier or cage. All piggies are sent home with a small "blanket" that carries their mother's scent.